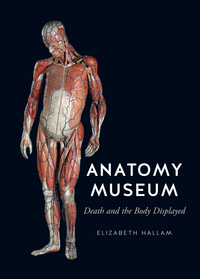 The Wellcome Medal for Anthropology as Applied to Medical Problems, 2016 has been awarded to Elizabeth Hallam for her book Anatomy Museum: Death and the Body Displayed. The medal and prize are given by the Wellcome Trust and they are awarded biennially, by the Royal Anthropological Institute, for published work that makes a significant contribution to research in anthropology as applied to medical problems. Elizabeth Hallam is a Research Associate at the School of Anthropology and Museum Ethnography, University of Oxford, and a Senior Research Fellow at the Department of Anthropology, University of Aberdeen. Her books include the co-authored Death, Memory and Material Culture (2001), the co-edited volumes Medical Museums: Past, Present, Future (2013) and Making and Growing: Anthropological Studies of Organisms and Artefacts (2014), and the edited Designing Bodies: Models of Human Anatomy from Wax to Plastics (2015). This innovative book opens up a wide-ranging history of deceased bodies on display, from medieval relics, to nineteenth-century mega-collections of human remains, to the controversial Body Worlds exhibition that is touring the globe. Find out more about Anatomy Museum on our website.